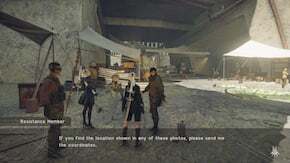 Photographs is a Side Quest in NieR: Automata. "A girl at the Resistance camp claims to have lost her memories in a battle, and can't remember the events surronding some important images in her possession. Find the locations in the three faded photographs." "Upon seeing the photographs, the girl slowly regains her memories. It turns out they were the last data her lover sent to her before dying in battle." One of the images is from the Desert Zone. Amusement Park main gate to boss area. Give the coordinates and the restored photograph to the girl. This quest becomes available after the Goliath event has happened and part of City Ruins has collapsed. Go to the Resistance Camp and talk to the girl android by the entrance. She will share three pictures with you and you must find each location that they belong to. Desert Zone: Go past the Desert: Center access point, and you will encounter a sand storm with invisible walls that block your path. Naviagate the storm by using your map unti you emerge on a sunny area. Go towards the marker to find the Oasis and a YoRHa soldier. The quest auto-updates as you get near. Forest Zone: From the entry point, follow the water down a very large waterfall with some enemy machines, boards and moose. Stand at the foot of the waterfalls to update the picture. Return to the Resistance Camp to obtain your reward. Can&apos;t do this quest right after you get it without progressing in the story further, since the Forest area is blocked off until you get the main quest that has you go there. Be sure you have map details of the area first, otherwise quest wont update!